Today Panasonic announced the latest addition to their Toughbook family of rugged portable computers. The 10.4-inch convertible tablet Panasonic Toughbook 19 packs some serious processing power with 1.2 GHz Intel I5 -540UM CPU (with Turbo boost up to 2GHz) and 2GB of DDR3 RAM and comes with either a 160GB HDD or a 128GB SSD. 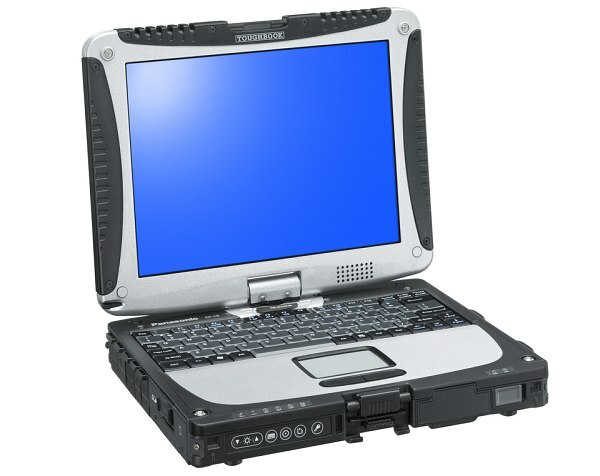 What’s key here however is the MIL-STD-810G certification, confirming the Toughbook 19 ability to withstand a six-foot drop and the IP65 rating, indicating complete dust and water jets resistance. Connectivity is also splendid with 2 USB ports, Wi-Fi b/g/n and Bluetooth being a standard, while Gobi and WiMAX are available as options. There are only a few things that don’t seem quite cool about the new Panasonic convertible tablet. For one, I’m not sure if the swivel hinge will be as hard to break as the rest of the device, considering the record of similar parts in other mobile devices. Next the Toughbook 19 weighs 2.31 kg (5.1 lbs) which is a lot for a 10-inch device. But improved durability took its toll on this one I guess. Oh and the price starts from 3 399 US dollars. Ouch!